While struggling with the reality of being a human instead of a myth, the strong black woman passed away. Medical sources say she died of natural causes, but those who knew her know she died from being silent when she should have been screaming, smiling when she should have been raging, from being sick and not wanting anyone to know because her pain might inconvenience them. 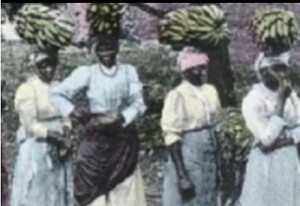 Turn of the 20th century Caribbean women laboured in the fields while others struggled for rights. She died from an overdose of other people clinging to her when she didn’t have enough energy for herself. She died from being responsible, because she was the last rung on the ladder and there was no one under her she could dump on. She died from being dragged down and sat upon by un-evolved women posing as sisters. She died from pretending the life she was living was a Kodak moment instead of a 20th century, post slavery nightmare! She died from myths that would not allow her to show weakness without being chastised by the lazy and the hazy. She died from hiding her real feelings until they became hard and bitter enough to invade her womb and breast like angry tumors. She died from always lifting something; from heavy boxes to refrigerators. She died of shock in courtrooms where she sat, alone, watching her children being legally lynched. Sometimes, she was stomped to death by racism and sexism, executed by hi-tech ignorance while she carried the family in her belly, the community on her head and the race on her back! The story of International Women’s Day seems to be one of European immigrant women in New York at the beginning of the 20th century. There is no mention of the countless enslaved African women who laboured without pay in New York and across the United States of America. No mention of the enslaved African women whose unpaid labour enriched white people in Central, North, South America and Europe and their struggles for freedom. We have known that for many centuries as evidenced by the words of an ancient African proverb, “Until the lion has his historian the hunter will always be the hero.” The contributions of African American women have been eliminated from the story of the women’s movement. When it came to work, enslaved African women were not discriminated against along gender lines. Frederick Law Olmsted wrote in “Journeys and Explorations in the Cotton Kingdom” published in 1861 “We stopped, for some time, on this plantation, near where some thirty men and women were at work, repairing the road. The women were in majority, and were engaged at exactly the same labor as the men; driving the carts, loading them with dirt, and dumping them upon the road; cutting down trees, and drawing wood by hand, to lay across the miry places; hoeing, and shoveling.” In 1985 Jacqueline Jones also writes in “Labor of Love, Labor of Sorrow” that enslaved African women did the same work as their male counterparts. In spite of the back breaking chores enslaved women were forced to perform they were also expected to bear and rear children and they were victimized by sexual predators. Enslaved African women resisted in various ways and this probably led to the “Strong Black Woman” myth that many of us still try to make a reality. Harriet Tubman who transitioned on March 10, 1913 is one of our sheroes whose exploits have reached mythic proportions. She was a conductor on the Underground Railroad who made 19 trips into enemy territory and rescued more than 300 slaves in spite of a $40,000 bounty on her head. She also worked as cook, nurse and spy for the Union army during the American Civil War. One of our lesser known sheroes was Milla Granson who resisted by educating her people. It was illegal for enslaved Africans to be literate; but not only did Milla Granson learn to read and write, she taught other enslaved Africans. Risking her life, she held classes in her cabin from 11:00 p.m. to 2:00 a.m. Holding classes of 12 students at a time; she taught hundreds of enslaved Africans to read and write. In Lerner’s Documentary History, under the heading “A Slave Woman Runs a Midnight School” she informs us that “a number of them wrote their own passes and started for Canada.” Those strong black women resisted their enslavement by any means necessary. After the abolition of chattel slavery in the United States (1865) the kind of work that was available to African American women was reminiscent of the work they did during their enslavement. They worked as housekeepers, servants, laundresses, cooks, maids and washerwomen. Those few who were “fortunate” to become employed as factory workers worked longer hours and made less than white women. It is hardly likely that there were any African American women in the group of 15,000 factory workers who marched through the streets of Manhattan on March 8, 1908 because they would not have been “granted the privilege” of working in a factory in New York. Even though African women are not written into the history of the beginning of International Women’s Day, we have contributed to the women’s movement and thankfully we have historians who write our stories.